Ø Cash – as it is issued by a Nation State – in minted coins and printed notes. The Bank of England calls this ‘narrow money’ or NIB ‘not interest bearing’. Ø Credit – as it is issued by any bank or building society – at a rate of interest that depends on short, medium or long time intervals. What is lacking, is the source of interest which is required to pay for Credit. As a consequence, everybody is borrowing – at interest- from Peter to pay capital – and interest – to Paul. Time is not only of the essence, it is said to be money. And it is especially money for everybody who has the right, privilege or monopoly to charge interest on capital over time. In addition to Cash and Credit, we now have digital money that can be issued in national currency by the usual institutions and authorities or as private currencies such as Friendly Favors. Ripple is an open source project that facilitates money transfers, debts and credit with friends and family such that one becomes one’s own banker. The Yahoo/Google payment system PayPal works in a similar way and now has 150 million accounts worldwide. This demonstrates, above all else, the degree to which money as IOU is a matter of trust. This trust in authorities and governments is dwindling at the same pace as the share of Cash in the economy has crumbled. It is generally not known what devastatingly crippling effects the Cash : Credit ratio has. In the UK it can be quantified since World War II, but the principles are the same in any country and any currency. It boils down to the mathematics of compounding interest on Credit compared to not interest-bearing Cash. 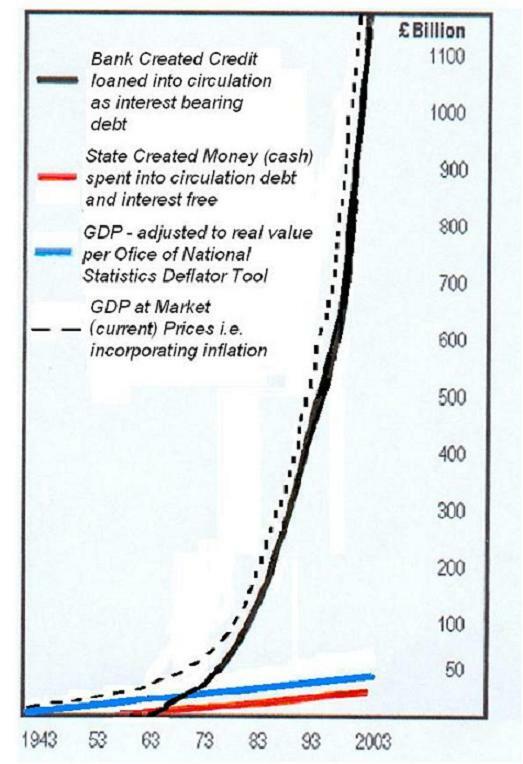 To illustrate this catastrophic effect, the most complete graph on the web dates to 1943[if !supportFootnotes]–>. Clicking on the graphs gives you larger versions. It was compiled by Ron F. Morrison, an accountant and business man, who used to get Abstracts of National Statistics from his library. Double clicking the graph shows more details. 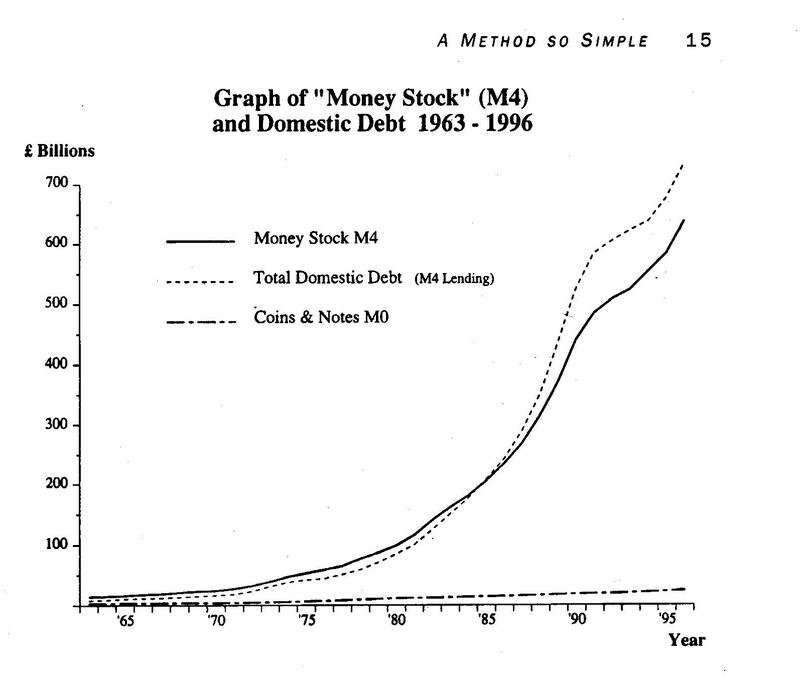 In 1998, Michael Rowbotham’s The Grip of Death – A Study of Modern Money, Debt Slavery and Destructive Economics was published making the same point: while the Credit share grows and grows and grows, the Cash share of the money supply dwindles and crumbles. The Wikipedia entry discredits Michael Rowbotham and monetary reformers for not having ‘formal training’. I would like to suggest that my formal training as a mathematician and systems analyst outweighs the training of any economist. Why would there otherwise be a whole movement of ‘post-autistic’ or ‘real world’ economics that originated from students in Paris in June 2000? 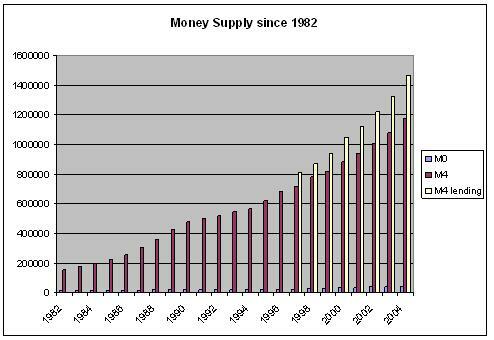 When I analysed the statistics provided by the Bank of England in 2004, I got the figures below. Please note that the M0 figures have become statistically so insignificant that their publication was discontinued in April 2006. M4 lending was introduced in 1996 as a new level of wholesale M4 – provided to a new level of institutions. The abbreviations used are: MFI: Monetary Financial Institutions (banks and building societies) PFI: Private Financial Institution, OFC: Other Financial Corporation. Of course, why should you not be welcome? Thanks for the compliments!